Eufora sent me their Fixation Styling Wax for review. I chose this product for my husband to use. I had my hubby test it out right away and he loves it. He said that it seems to be very high quality and that it worked well in his hair. It was not greasy and was easy to use. I smelled it and thought that it had a nice light smell. This product creates "texture, separation, and lift with a medium to strong hold". It is beeswax based which is very neat! All you have to do is put a little in your hand and work throughout your hair to the style that you want. Also, their products are cruelty free! 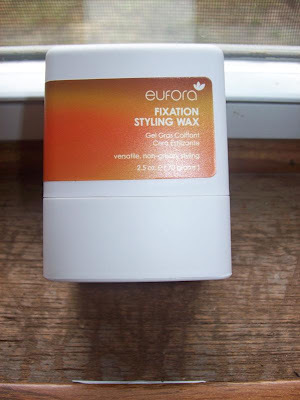 Where to buy: you can search on the Eufora website and find a salon near you that sells this product! Thanks Eufora for the great styling wax!